Stamp Courtyard on cream card stock with Memories black ink. Color with pencils. Apply chalks for background color. Layer onto mustard color card stock. 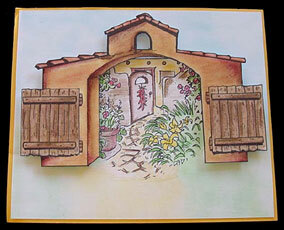 On separate cream card stock, stamp adobe gate using Memories black ink and color with both chalks and pencils. Cut out and place over courtyard with mini foam dots.